Speed Factor Ltd. is located at 1875 Pembina Hwy – Unit 7 in Winnipeg, Manitoba, Canada. Since opening in 2002, we have expanded our retail business, into a web-based retailer and wholesaler in order to serve our customers better. Speed Factor Ltd. is owned and operated by car enthusiasts who love cars. Our goal is to ensure that our customers get exactly what they want for their vehicles at the very best price. To enhance our service to our customers, we specialize in a huge selection of brand names that is based on what you, the customer, has requested we carry. We specialize in all the major brands and accessories, with more added each day. 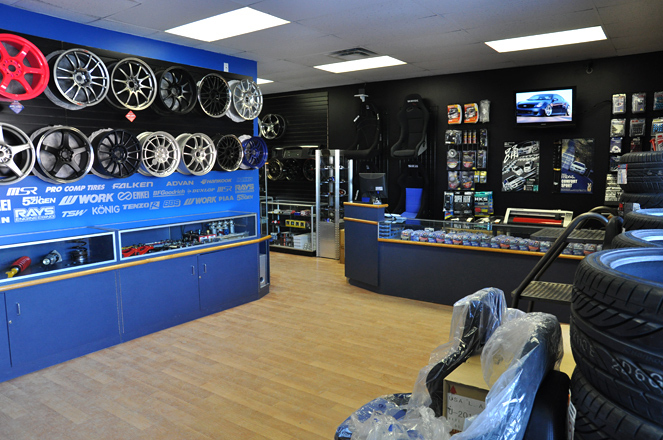 We also carry a huge inventory of performance parts for most applications at our retail store in Winnipeg. Want to know if an item is stock? Just send us an email or give us a phone call and we would be more than happy to assist you. Our Staff at Speed Factor are very knowledgeable about the products we sell. Have a question about parts on the website or would like something you don’t see? Please send us an email or give us a call with any questions that you may have. Not sure which brands or items would work best with your application? Our staff is more than willing to help you choose and/or recommend the best brands and parts for your specific application. At Speed Factor, we believe that showing off your ride is part of the fun. If you are a customer of Speed Factor, we would love to show off your ride on our site. Please send us any photos that you would like us to show off for you. As you browse through our site, we would encourage you to email or call us regarding any suggestions you many have for our site, new products you would like to see us offer, or any other questions or comments you many have. Retail and Wholesale inquires are appreciated and encouraged.